OPPO didn’t just announce the Find X at its event in Paris. The Chinese brand also presented a more luxurious version by Lamborghini. But what distinguishes this special model from the standard one? Well, there’s a few important elements, not to mention that staggering price tag. What distinguishes the Lamborghini OPPO Find X? In our hands-on review you can read all about the elements that distinguish the Find X: an almost bezel-less display, a body made of curved 3D glass, the absence of a notch and the presence of three pop-up cameras. The Find X stands out from the crowd and its luxury Lamborghini version follows in the footsteps while still managing to differentiate itself. But how exactly? Let’s start from the purely visual elements. The smartphone developed in collaboration with the car manufacturer offers a carbon effect body covered with glass and the unmistakable Lamborghini logo. The smartphone comes in a black and orange package that houses the charger and charging cable. The Lamborghini version's battery has 3400 mAh instead of 3730 mAh, and its fully rechargeable in 35 minutes thanks to Super VOOC Fast Charge. That’s a dream for many uses and a choice that will remind you of Lamborghini’s cars. The internal memory represents another distinguishing feature, which increases from 256GB to 512GB. Last but not least, if you thought that spending just over $1,000 for a smartphone was too much, get ready for just under $2,000. It's impossible not to think of the Porsche Design line from Huawei. The idea behind it is the same: to work with another car manufacturer to create a luxury device together, with a few more gems than the standard model, a fancy box and a considerably higher price. These two brands, in addition to coming from the same country, also shared Paris as the city chosen to present these special variants (Huawei presented the Mate RS Porsche Design in April along with the new P20 line). 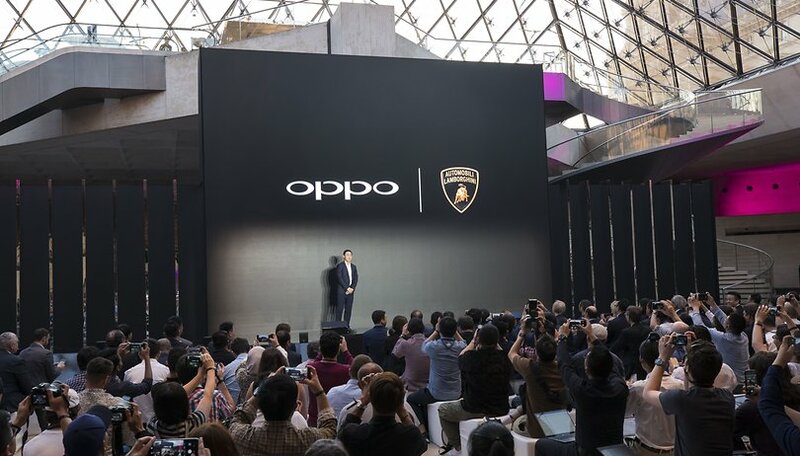 One of the easiest similarities to notice is that OPPO wants to grow immediately and boast its luxury and outstanding performance throughout the world. OPPO’s vice president, Anyi Jiang, was clear on stage in her announcement that OPPO was returning to Europe with a clear strategy. The company’s goal is to become an environmentally friendly company and grow its global presence. OPPO is currently present in more than 30 countries and has more than 200 million users in China. That makes it the 2nd largest smartphone manufacturer in China and the 4th largest worldwide. To initially focus on only four specific markets (France, Spain, Italy and the Netherlands) and then expand to other markets at a later stage. Aim for teamwork with local staff who can meet local needs and speak the local language to better support different markets. Remain open to innovation in collaboration with young European designers. The first step has been taken, though with two expensive high-end devices that won’t inspire the masses. But that’s how OPPO has decided to return on the offensive, immediately deploying its best weapons to show what it’s capable of and what it wants to conquer. OPPO is back, and it doesn’t want to give up on the flagship sector. What do you think about OPPO's high-end strategy? I like the new innovation of the pop-up camera. Will see how it plays out in real time usage. But I do believe it will work very well! Always nice to see new technology from any OEM!